A high-end SSD that competes with the Samsung 850 Pro with handy features, but not the best bang-for-your-buck if you just need more storage. OCZ has been making consumer SSDs for almost a decade now, and during that time the brand has seen its ups and downs. Early models were known for high failure rates, with many users encountering problems that led to losing their OS partition and data. Although later models have been much more reliable, those dark years certainly damaged the brand’s reputation. Then OCZ ran into financial problems, and in late 2013 was acquired by Toshiba, a behemoth in flash memory manufacturing. The new OCZ has an infusion of fresh engineering talent and flash memory straight from the source, giving it a fighting chance against the likes of Samsung with its new SSDs. OCZ has launched three new SSD ranges this year with geometry-inspired naming conventions. The entry-level model is the Arc 100, the Vertex 460A model is for the mid range and the Vector 150 and 180 are the enthusiast models. These are all based off 2-bit MLC Toshiba A19nm flash memory, the same type of NAND that is licensed to other brands. For example, the AMD Radeon R7 SSD and Fujifilm high performance HQ-Pro use this very same type of flash. 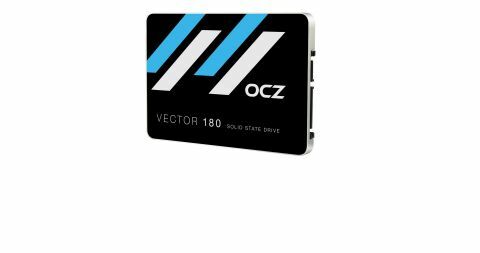 The OCZ Vector 180 is the company’s new flagship 2.5-inch SSD, designed to compete with the best performing consumer drives on the market, such as Samsung’s 850 Pro and SanDisk’s Extreme Pro SSDs. As such it’s in a relatively similar price bracket, with a $150 price tag for the 240GB model we’re testing, which closely matches the pricing on both SanDisk and Samsung’s drives. It comes in 120GB, 240GB, 480GB and 960GB capacities, with a controller from Indilinx called the Barefoot 3. This controller features an ARM Cortex processor, with a co-processor called Aragon, along with a SATA 6GB/sec interface and a DRAM controller. Although OCZ keeps some details close to its chest, it’s the M00 Barefoot 3 in the Vector 180, which runs at a higher clock speed, close to 400MHz, while the M10 variant found in the lower-tiered Arc and Vertex drives run at 325MHz. The controller supports many of the usual features found in a modern SSD, with TRIM and AES-256 encryption, although it lacks the more sophisticated Opal encryption. A small amount of DDR3 memory is provided for caching data, with 512MB of Micron DDR3 memory on the 120GB and 240GB models, and 1GB on the 480GB and 960GB models. This closely matches the configuration used in other brands, with more memory available in larger capacity drives. There’s also a feature called power failure management plus (better shortened to PFM+) which provides at least some form of protection against data loss if power is unexpectedly cut from the drive. Although this doesn’t protect data held in the SSD cache waiting to be written to the drive, anything already stored on the NAND will remain in good order after a power loss. Power-loss protection is common in enterprise SSDs, surprisingly few consumer drives offer it. It’s absent from all of Samsung’s drives, for example, and the only other well-known example of a consumer SSD to offer this feature is Crucial’s MX100. The package contains a few extras too. There’s a code for a downloadable copy of Acronis True HD, used to copy your entire system partition from your old hard disk to the Vector 180. There’s also a metal 3.5-inch mounting bracket, which is really only useful if your case is as old as the hills, since nearly every PC chassis now has plenty of internal space to mount 2.5-inch drives. "The most noticeable performance leap you’ll ever experience from an SSD is always that first jump from a hard disk." As we found when we tested a wide range of SSD models in the best SSD for gaming, the differences in real-world performance between different brands and models of SATA SSDs is incredibly slim. You might see one SSD take an extra second to load Windows, or another with a higher sequential transfer rate, which is the headline performance figure most people see when they look at SSD performance. But in reality, the most noticeable performance leap you’ll ever experience from an SSD is always that first jump from a hard disk, mainly because of the improvement in latency times. There’s no more waiting for the disk to spin up and a mechanical arm to move into place. Differentiating between SSDs now depends on more than raw benchmark results alone—at least until far faster PCIe SSDs become mainstream enough to change the game. Although we’ve fully tested many technical aspects of the Vector 180, OCZ has worked hard on improving the overall product offering. One example is the warranty. A standard warranty of five years comes with the Vector 180, which is generally more than adequate, since the ten years offered by other firms is so long, the drive will likely be completely obsolete by the end of the period. But OCZ goes a bit further than just offering a five-year guarantee, with what it calls ShieldPlus warranty. If you run into a problem, just enter your serial number, click a few buttons, print out a paid return shipping label and you’ll have a brand new replacement drive, without needing to worry about proof of purchase. Although it should be noted this service is at present only available in the US, Canada, European Union and Taiwan. Bad luck Aussies, Kiwis and others. Another highly touted feature of the Vector 180 is better sustained performance than other SSDs. While most SSD firms tout excellent sequential read and write speeds, it’s the performance over time that may end up being a bigger factor. Out of the box and unused, an SSD usually performs as well as its quoted speeds. But over time, as cells are written to over and over, you’ll notice some performance degradation. The TRIM command restores much of this performance by performing garbage collection in the background, but you’ll also lose performance due to the need for additional error correction by the controller, which reduces overall write speeds. With some clever tricks implemented in the controller firmware, by running simulations of long-term drive use, OCZ says the Vector 180 delivers better sustained performance than competing models, including the Samsung 850 Pro, with fewer signs of performance degradation over time. Anandtech's in-depth consistency testing found that the Vector 180 did indeed have the fastest average IOPS over time, but it also had the highest variation, and became less and less consistent at larger sizes. The 240GB version performed the best in terms of consistency. That's an unfortuante side effect of the Barefoot 3 controller. OCZ has also completely revamped its SSD maintenance software. Now called SSD Guru, the interface is as simple as can be, with plenty of useful functions and features. There’s a health bar, showing the estimation for the number of drive writes remaining and a temperature indicator. The status of two aspects of your system configuration that affect performance are also displayed: the BIOS AHCI setting and whether the Vector 180 is connected to a 6GB/sec SATA III port. There’s also a firmware update tool and manual over provisioning. But perhaps most useful is the built-in Secure Erase function. Without support software, erasing an SSD can be like a voodoo ritual. It’s best done with a Linux distribution (Parted Magic works very well), loaded off a USB stick or a second drive. You then need to enter a few long commands. For data security reasons, as standard, a drive cannot be erased and wiped by any old process running on your computer. Before it can be erased, it has to be unfrozen. There are really only a few ways to do this. Putting your computer to sleep then waking it might do the trick, but the best way to do so in a desktop PC is by unplugging the power cable for a few seconds, then plugging it back in. It’s all quite messy. SSD Guru does all this for you. As long as the OCZ Vector 180 isn’t your system drive, the entire SSD is erased with a single click. It takes about 20 seconds. If the Vector 180 is your system drive, then OCZ provides a bootable ISO on its website that can be copied to a USB stick. It’s all been very well thought out. In terms of functionality and appearance, it matches Samsung’s Magician software almost exactly, with one exception. It lacks a Rapid mode for caching to memory, which can provides a small performance boost when using Samsung’s drives (though Rapid looks great in benchmarks, it can be hard to notice in real-world use). This was the same test PC used for the testing of all the SSDs in the group test mentioned above. As such, these results can be compared directly to those from that test. In AS SSD the 240GB Vector 180 hits a high note in sequential read performance with 487.35 MB/sec, and sequential write performance of 475.65 MB/sec. These results are slightly short of some other high-end drives such as Samsung’s 850 Pro and SanDisk’s Extreme Pro, which both go over the 500 MB/sec mark, but it’s still a fairly good result. The IOPS figures are better though, with almost 87000 read and 82000 write. Although this is slightly lower than the quoted figures, once again, this is a good score. In both cases, larger capacities will improve on these scores. CrystalDiskMark results also come out a bit lower than other 240GB drives, showing just 430 MB/sec read and 480 MB/sec write. Although its synthetic results aren’t top of the performance league, the OCZ Vector 180 scores adequately in all the tests, with some good scores in the (semi) real-world tests of PCMark08, too. While it doesn’t quite match other drives in sequential performance, it still does reasonably and the IOPS figures are also pretty good. The extra features make a big difference. While plenty of firms now offer excellent SSD maintenance software, OCZ’s SSD Guru is just about as good as any of them. Although it lacks the Rapid memory cache mode of Samsung’s software, everything else is in place, with some useful extras like a manual TRIM command and built-in secure erase. Although not quite class leading, its endurance is excellent too, with 50GB/day over five years in the 240GB model. This works out to just under 100TB over five years. While on paper it’s not quite as high as the 150TB offered by Samsung’s 850 Pro, it’s still unlikely to cause problems under normal daily workloads. It’s also worth pointing out that quoted figures are usually a worst-case scenario. SSD endurance was once a major concern and a potential reason to avoid flash-based storage, but with the improvements in modern drives, unless you’re absolutely trying to destroy an SSD with writes, it’s unlikely you’ll ever hit its write limits. Would we buy the Vector 180 over another drive? It depends. The performance of the Vector 180 won’t disappoint, but from our results, the Samsung 850 Pro and SanDisk Extreme Pro SSDs have a slight overall performance lead in synthetic tests. In the real world though, these differences will certainly be negligible. More importantly, though the Vector 180 competes with some high-end drives, the more affordable Samsung 850 EVO and Crucial BX100 are just as good for gaming and cheaper thanks to a few dropped bells and whistles. The Vector 180's premium nets you software support, power-loss protection and a great warranty.